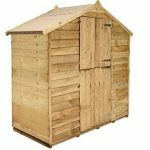 This is a very inexpensive shed that has plenty of good aspects. For example, it has a number of customisation options that are useful and make for an even better building. The apex roof is attractive, and the interior is quite spacious. 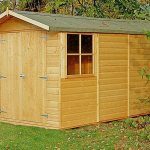 The building also benefits from a thicker frame than you might find on other sheds in this price range, and that is a strong feature. Other good aspects include options in the flooring, which we found to be a real benefit, and offered the chance to really add value. 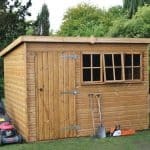 A good quality entry level shed that you can add to and tweak to make perfect. A windowless security shed, this building measures 202 cm in width. The depth of the shed is 238.8 cm. It comes with an apex roof, which has been made with solid sheet materials. 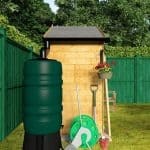 These are pretty strong roofs in general, and this one should provide plenty of protection against rainwater. The manufacturer has supplied a felt covering for this roof, and while this may need replacing after a few years, it will provide a strong barrier against rainwater, and should help with any issues around damp. With this building you get overlap cladding. 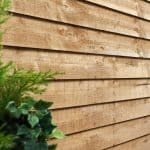 This is generally seen as being the most cost-effective cladding to manufacture, but it has clear benefits as well. For example, it is very durable, and will provide plenty of protection over time. As long as it is treated, it will provide a solid level of protection against the elements. At the same time, it’s not the strongest cladding. So you won’t be able to attach any shelving or heavy items to the interior walls. As long as you bear that in mind, it’s reliable and durable. Any shortfalls in the cladding are made up for somewhat with the framing that the building comes with. 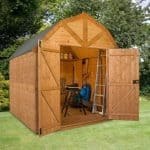 Double framing is used in this shed, and this gives you a much stronger construction. It’s a very valuable feature, and we were happy to see this on such a low cost item. You do have options when it comes to flooring, and this is a useful aspect of the purchase. 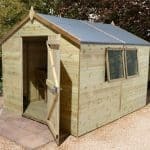 Having solid sheet flooring, for example, is a totally adequate solution as long as you don’t intend to use the shed for heavy-duty purposes. In other words, it would not be a good idea to set up a full workshop in this building. However, solid sheet will work well if you have light footfall over time. We would choose the tongue and groove flooring, simply because this will extend the life of the building and give you a strong floor. 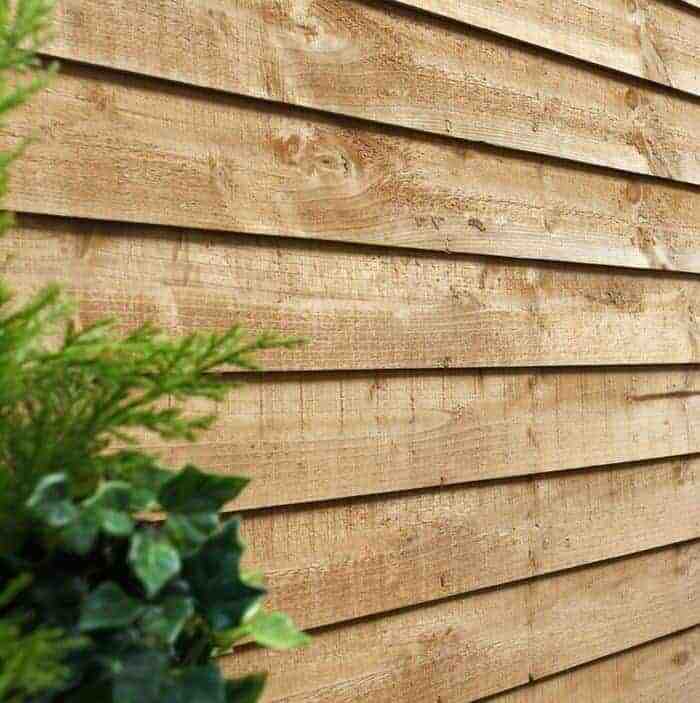 Tongue and groove locks together seamlessly, and provides a watertight, solid surface. The building has not been treated. This means that this job is down to you as soon as you receive the item. It’s important that you do treat the building as quickly as possible, and then treat it on an annual basis. Otherwise, wear and tear will accumulate and bring you a damaged building. In addition to this, there is a 10-year guarantee for the building, but this will be voided if you do not treat it. 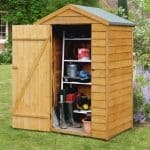 Security sheds don’t have windows, and this is a big part of their appeal. Thieves won’t be tempted to look into the building if they don’t know what’s in there. The building does come with large and heavy double doors, and these have a width opening of 166.5 cm. 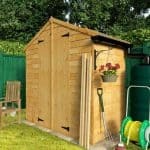 This is very good and practical, in that it will allow you to bring in large tools and equipment without worrying about damaging them or the building. We were surprised to see that this building did not have a turn button, catch, or any kind of lock option. In addition, the building doesn’t offer any kind of customisation options as regards locking systems. Therefore, you are limited to having a windowless building as a security measure. This, in our eyes, is not ideal. We suggest that you invest in some kind of locking system as soon as the building is up. It was nice to see that the manufacturer has offered you the opportunity to choose a base for the building. Having a base is vital, because if you don’t have one the moisture that can build up in grass, for example, can lead to rot attacking the building. So we recommend that you do purchase one of the bases the company offers, or at least the bearer option. Both of these will lift the building up and therefore reduce the potential impact of damp. A good option offered here by BillyOh is the chance to choose your shelving. You can have shelving throughout the building, and this brings you more usability. You can easily build a shelving selection that allows you to enhance the storage inside. If you want to, you can choose colours for the building. The paint for the trim and the walls is inexpensive, and it allows you to add your personal touch. If you are the type of gardener who wants to make his or her mark, here is your chance to do so. You have a roof that has been made using solid sheet materials and overlap cladding, so there is a definite nod towards the more ‘value’ end here. But this is still a quality building. The cladding will protect the interior, and there is felt on that roof that does a good job of keeping things dry. A couple more options here would have helped though. The building will stay dry, and if you add a couple of options like the base in, you can add more durability. As long as you treat it, you should find that it lasts the 10 years the guarantee says it will. This is not a huge building, and this is a big factor in the score here. However, if you add shelving you instantly have more storage, so there is scope. This is an extremely easy building to put together as long as two people are working on it. If you are on your own, bear in mind you have to paint it and treat it, which takes time. Two days should be allocated. 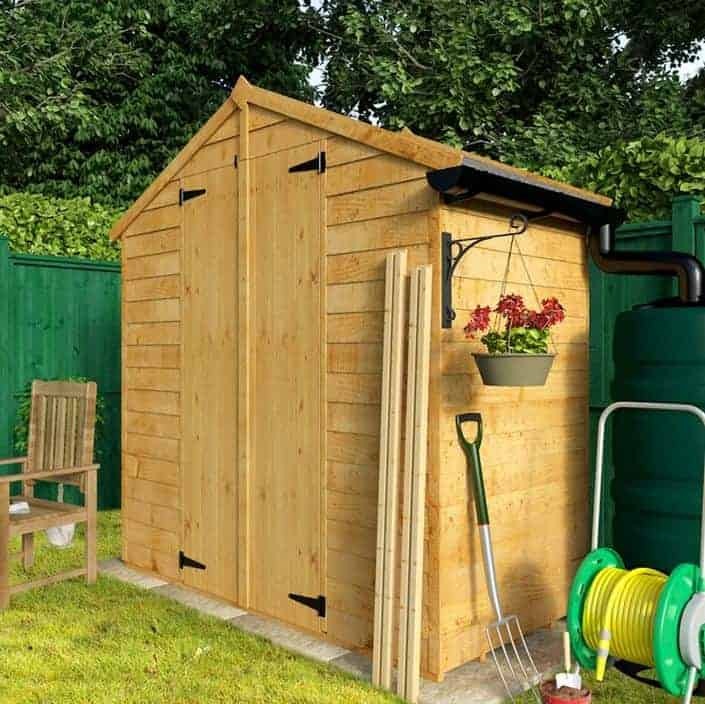 This is a very inexpensive shed, and we can’t see the costs rising too much even as you add extras. The quality is very much entry-level at times, but that shouldn’t take away from the fact that there is durability here, and potential for customisation. 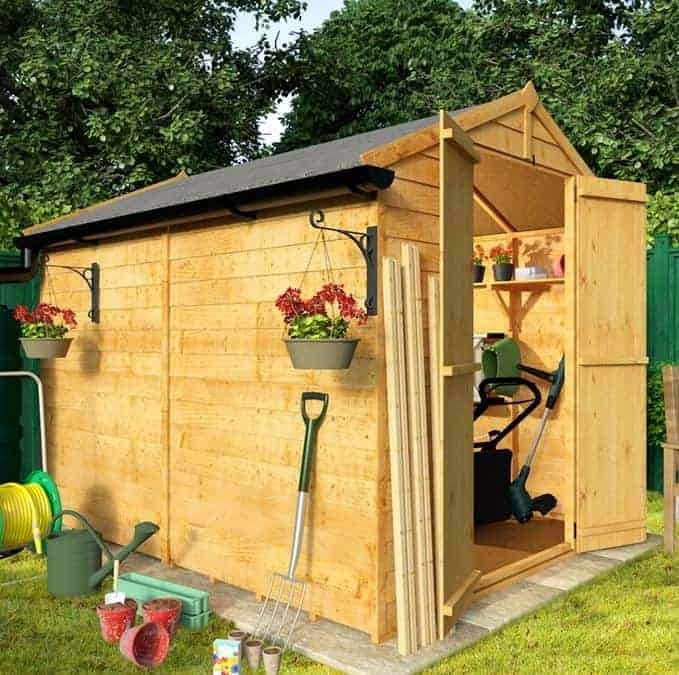 Final Thoughts: We liked this shed. It doesn’t have a lot in the way of quality in the build, such as tongue and groove, which we would have loved to see. But that has plenty to do with the price. 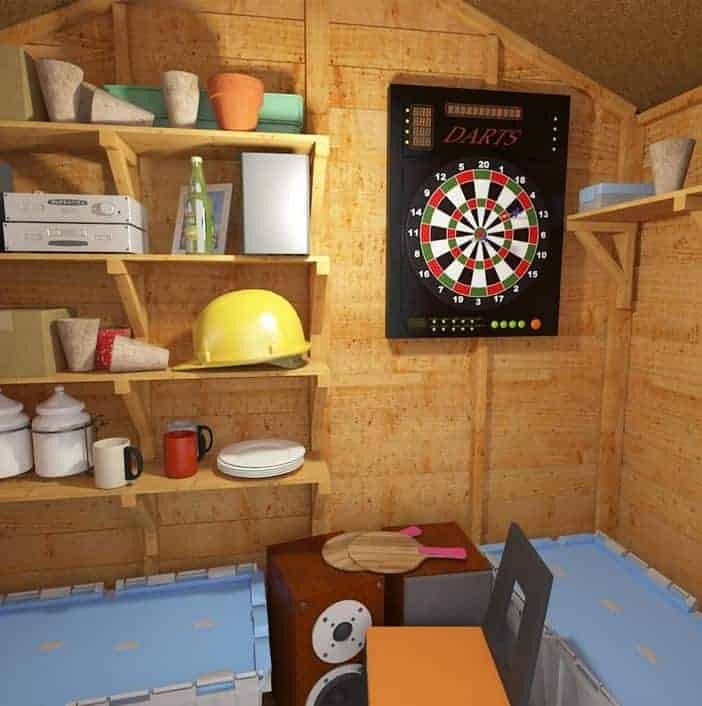 We appreciated the fact that you can both make the shed more durable and more useful with just a few tweaks and customising. 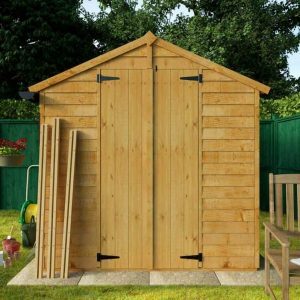 So as an entry level shed, it has plenty of potential and therefore value.